With one foot already in the Caribbean, Miami is one giant playground of a disembarking port city, complete with stretches of white sand beach only outshined but the coils of hot pink neon lights, making it the crowned 'cruise capital of the world'. Most associated with Miami is South Beach, both the long stretch of sand and the Art Deco neighbourhood alongside famous for nightlife, restaurants and shopping. 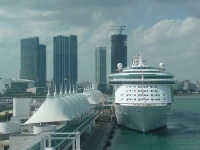 With over four million passengers a year, the Port of Miami is the home of about 24 different cruise ships and ten cruise lines departing to all over the world, particularly the Caribbean. The port is located on Dodge Island and connects to the city centre via a short bridge. New cruise passenger terminal buildings D and E and four older terminals have every conceivable passenger amenity. The city centre can be walked to over Port Blvd. Bridge, although a fleet of taxis, rental car agencies and shuttle buses are available from the cruise terminals. From inside the city centre an elevated train (Metrorail) and monorail (Metroover) connect to most destinations and a bus service (Metrobus) is extensive if confusing. The most famous landmark in Miami is South Beach and the surrounding neighbourhood, which is famous for its art deco designs, restaurants and shops. Little Havana, Coral Gables and Coconut Grove are other fun and historic neighbourhoods. The Metrozoo and Seaquarium both offer chances to see rare wildlife, as do Parrot Island and Monkey Jungle, which have a more natural theme. Replanted from its home in Spain, the Monastery of St. Bernard de Clairvaux is the oldest building in the western hemisphere and a popular tourist site. Vizcaya Museum and Gardens is another historic Miami landmark. The best shopping is done in several open air malls, the famous Lincoln Road Mall and The Falls. Upscale shops are best found in both Miracle Mile and Bal Harbour. Near to the Port of Miami, Bayside Marketplace is a fun place to peruse souvenirs.